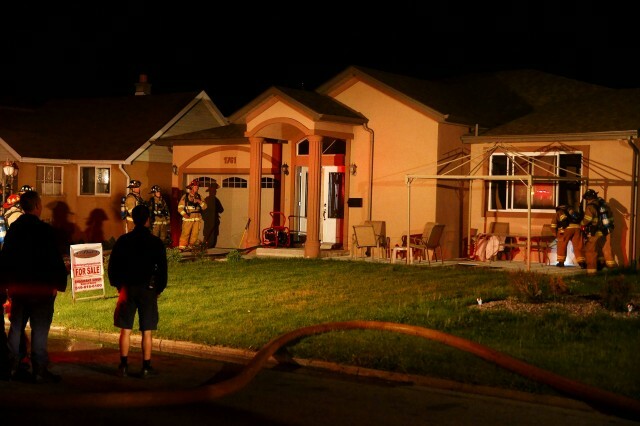 Windsor firefighters responded to reports of heavy smoke in the area of Randolph and Totten on Windsor’s west side, around 12:45am Sunday morning. A Windsor Police unit patrolling in the area initially noticed the smoke and contacted the fire department. Officers breached the front door of a house in the 1700 block of Randolph but were unable to enter as the smoke was too thick. They made their way to the rear door and observed obvious damage to the door leading them to believe that the home had been broken into. Upon arrival, firefighters discovered smoke pouring from the roof of the house on Randolph, a dead-end near the South Cameron Woodlot. Firefighters brought the fire under control within ten minutes. A heavy police presence was visible at the scene. There was no one in the house at the time of the fire. There are no injuries. A quick look at Google Streetview reveals that the house was built recently as it was not present in 2009 when Windsor was photographed. A sign in front of the house lists the property for sale. It was later determined that the occupants of the residence were not home at the time of the fire. The home owners arrived at the home shortly after officers arrived. Investigators determined that the blaze was an act of arson. The fire caused $75,000 in damages.